Submitted: September 2004. Accepted: October 2004. The class zygomycetes is divided into two orders mucorales and entomophthorales which produce dramatically different infections in humans collectively termed zygomycosis. Genera from the order entomophthorales are known to produce chronic subcutaneous infections called entomophthoromycosis in immunocompetent individuals. Over recent years the clinical importance of entomophthorales has significantly increased. The scope of disease involvement with this group of organisms has expanded beyond their role as weak pathogens causing localized disease in healthy individuals, to include them as causes of opportunistic infections and disseminated disease in individuals at risk. Early diagnosis, along with surgical debridement of affected tissues and systemic antifungals are needed for a successful outcome. Diagnosis of entomophthoromycosis is however difficult and is often made after a delay due to difficulty in demonstration and extraction of fungal elements from invaded tissues. The clinical manifestations, clinicopathologic and mycological findings and treatment outcomes of six patients diagnosed as having rhinofacial entomophthoromycosis are documented in the present study. Zygomycosis refers to a group of uncommon mycoses caused by fungi of the class zygomycetes. These are fast growing, largely saprophytic fungi with an ubiquitous distribution. To date more than 600 species have been described, however, infections in humans and animals are generally very rare. The class zygomycetes is subdivided into two orders, both containing human pathogens, the mucorales and the entomophthorales. Mucorales cause most human disease, accordingly, the term mucormycosis has commonly been used to describe diseases caused by these agents ignoring the role of entomophthorales in causing disease. A subsequent designation of "phycomycosis" was transiently employed to encompass members of both orders. The term zygomycosis is a relatively new term which is currently accepted to include all disease processes caused by the members of the class zygomycetes. This grouping of the mucorales and entomophthorales as causes of zygomycosis, however, does not adequately reflect the distinct epidemiologic and pathogenic features of these two orders which have dramatically different disease manifestations . Human disease caused by the order mucorales generally occurs in immunocompromised hosts as opportunistic infections and is characterized by a rapidly evolving course, tissue destruction and invasion of blood vessels [4, 5]. Members of the order entomophthorales on the other hand, produce subcutaneous and mucocutaneous infections of nasal and sinus tissue (entomophthoromycosis) in immunocompetent hosts [5, 6] .They derive their name from the Greek word "Entomon " ,meaning insect, reflecting their original identification as pathogens or parasites infecting insects . Diagnosis of zygomycosis relies on direct morphologic identification of mycotic elements and recovery of zygomycetes in culture from specimens obtained from the site of presumed involvement . In tissue sections zygomycetes are easily differentiated from other fungi by their characteristic hyphal morphology. They form broad ( 15 to 20 um ) , ribbon-like non septate ( coenocytic ) hyphae with wide angle branching ( 45 to 90° ). Infection with entomophthoromycosis is characterized by an important histological finding in the form of eosinophilic deposits around hyphae in H&E stained sections (Splenore - Hoeppli phenomenon) [2, 7]. Entomophthorales also produce characteristic colonies on standard mycology media. Colonies are dense, waxy and deeply furrowed and folded with a rapid growth at 37°C. Satellite colonies form from the germination of ejected sporangioles and older colonies become covered with short, aerial mycelia and conidiophores. The propulsion of conidia is characteristic of the genus. Conidia are forcibly discharged and stick to the Petri dish lid, completely clouding the view into culture with time [1, 2]. Human pathogens in the order entomophthorales include two species, the basidiobolus species which produce chronic subcutaneous mycosis of the trunk and extremities primarily in children , and the conidobolus species producing infections that present most commonly as chronic sinusitis zygomycosis. Infection is generally considered to originate in the sinuses, from which the fungus extends to involve cutaneous and subcutaneous tissues of the nose and face in what is known as rhinoentomophthoromycosis [9, 10, 11]. To date, no single therapy for entomophthoromycosis is recommended. Surgical debridement of the affected sinus with removal of the affecting fungus together with systemic antifungal therapy is required for optimal treatment results. Treatment is, however, not always successful. Potassium iodide, co-trimoxazole, amphotericin B, imidazoles and combinations of these agents have all been used, but no single drug has proved effective [12, 13]. Mycoses caused by entomophthorales historically have been limited to tropical and subtropical areas, and involve rather indolent courses affecting immunocompetent hosts [2, 6]. In recent years however, the geographic distribution and range of affected hosts associated with these agents have broadened [1, 5]. Occasional cases of disseminated and angioinvasive disease have recently been described, primarily in immunocompromised patients, suggesting a possible emerging role for this organism as an opportunist [1, 5, 14]. Studied patients were retrieved from the Dermatology and Venereology and ENT Departments at Ain Shams University through the years 2002 - 2004. They were all males; 5 adults and one child with an age range between 10 and 33 years. 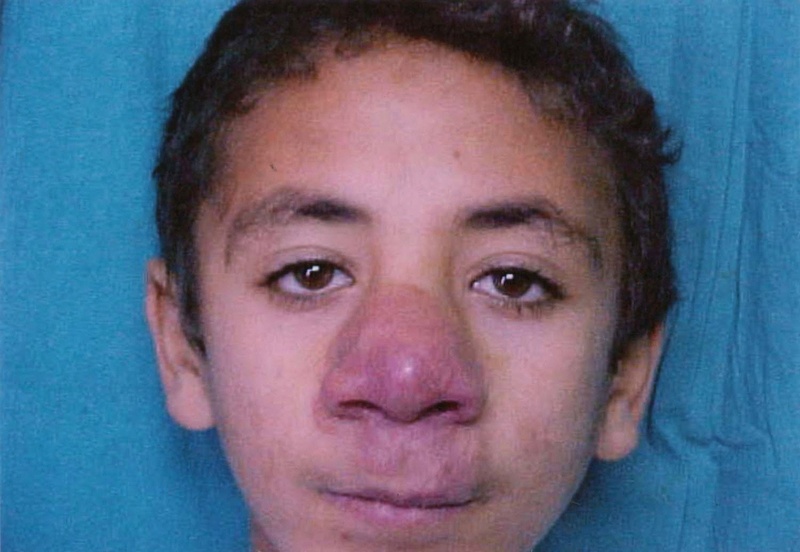 All had a common presentation of facial disfigurement due to swelling of the nose and perinasal tissues associated with symptoms of chronic sinusitis in the form of nasal stuffiness, post nasal drip, sinus pain and headache. Epistaxis was reported in one case. Lesions had been present for 7mth to 1.5 years. Patients were otherwise healthy with no underlying disease or immunological defect and none had been receiving immunosuppressive therapy. All patients were residents of semi- urban areas, 4 of which gave histories of outdoor occupations. Dermatologic examination revealed chronic slowly progressive dusky violaceous infiltrated nodules and plaques localized to the nose, upper lips and adjacent areas of the cheeks. Lesions were painless, firm and attached to the underlying tissues. 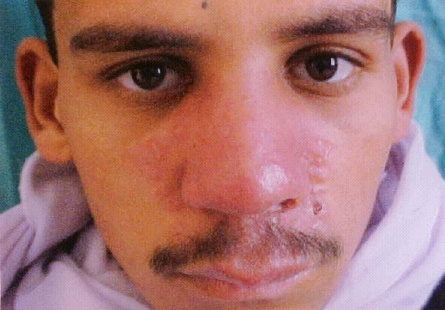 Generalized facial swelling was seen in one patient. ENT examination showed moderate to marked thickening of the nasal vestibule. In all the cases, the nasal mucosa revealed evident unilateral edema more marked in the inferior turbinate and the middle meatus. Mucosa of the meatus was polypoidal with granulation tissue formation obliterating its opening. Few firm polyps were detected originating from the anterior end of the middle meatus in one patient. Nasal discharge varied from mucoid to mucopurulent. 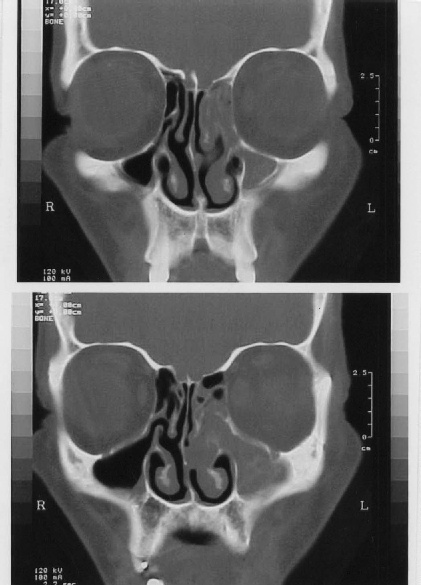 Computed tomography (CT) scans of the nose and paranasal sinuses showed evidence of unilateral anterior ethmoiditis with obstruction of the osteomeatal complex as a common feature in all cases. Signs of maxillary sinusitis were also present in 2 patients. No bone erosion or extra sinus extension to adjacent anatomic areas were encountered (Fig. 6, 7). Endoscopic sinus surgery (ESS) in the form of anterior ethmoidectomy was performed in all cases as a line of treatment for removal of sinus pathology. Additional procedures as septoplasty, partial inferior turbinectomy and / or middle meatal antrotomy were performed when indicated. 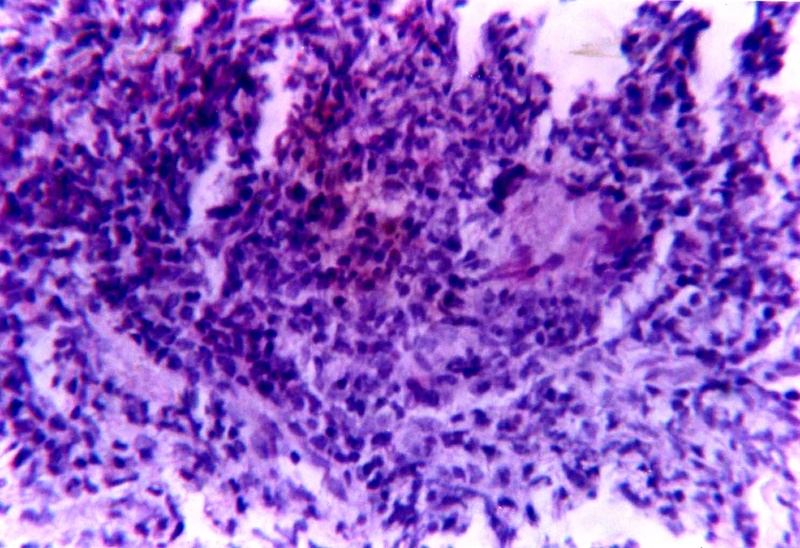 Surgical specimens of the sinus mucosa and skin biopsies of facial lesions were examined histopathologically and cultured for fungi. Tissue sections were stained with H & E and PAS. Specimens were inoculated on Sabouraud's dextrose agar plates containing chloramphenicol but no cyclohexamide. Plates were incubated at 37°C and examined daily for 1 week then at 2 and 4 weeks before being discarded. 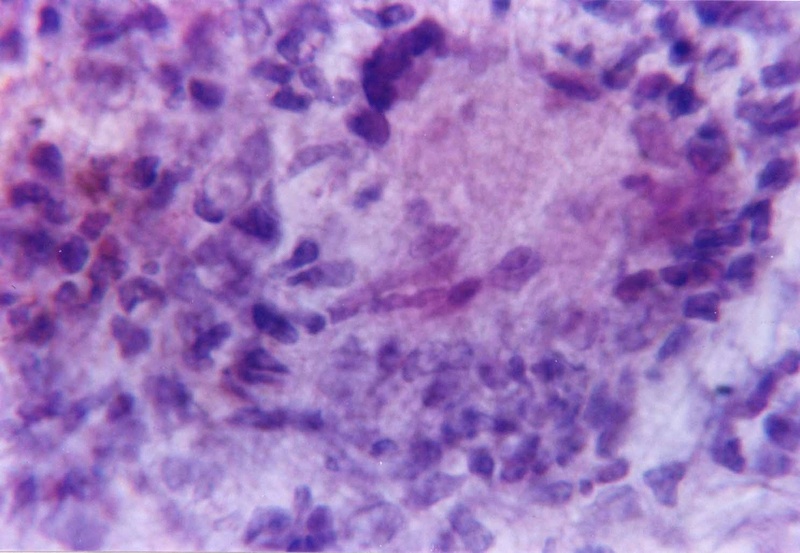 Haematoxilin and eosin stained sections of both skin and sinus mucosa revealed broad, thin walled hyphae characteristic of zygomycetes. Some of the hyphae were characteristically enveloped by an eosinophilic sheath, which facilitated their demonstration with H&E. A frequent finding in many sections was the presence of twisted and collapsed hyphae demonstrating bullous vesicles and irregular branching. 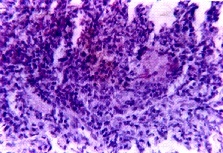 In some sections hyphal fragments were seen scattered throughout the tissue. The fungal elements were present among a chronic inflammatory granulomatous cellular infiltrate composed of lymphocytes, epithelioid cells, giant cells, histiocytes and rich in eosinophils (Fig. 1, 2, 3). The infiltrate extended to the subcutaneous tissue and sinus submucosa. In one patients healed granuloma with fibroblasts, histiocytes and edema were seen. No blood vessel invasion or tissue necrosis was detected. In PAS stained sections, hyphae were weakly stained and not well demonstrated. Fungal culture yielded positive results in only two patients with identification of Aspergillus species. Five of the 6 patients were initially treated with sinus debridement via ESS and itraconazole in a dose of 100 mg/day. In the first 2 months of treatment 3 patients showed no improvement and 1 patient showed only partial response. Itraconazole was increased to 200 mg/day and saturated solution of potassium iodide (SSKI) was added in an increasing dose from 5 to 40 drops three times a day or as maximally tolerated by the patient. After a follow up period of 4 months, patients showed moderate response to this combination and since then the lesions have partially resolved and no new lesions appeared. The fifth patient was incompliant; he discontinued the medication and received systemic steroids empirically for 2 weeks in a dose of 40 mg/day in another health care centre. He presented 1 month later with extensive facial lesions and pansinusitis. ESS was reperformed and the patient was given a combination therapy of itraconazole (200 mg/day) and co-trimoxazole (2 gm/day). This combination arrested the appearance of new lesions and partially reduced the size of existing ones. In the 6th patient (Fig. 8), the diagnosis was initially missed. The patient was treated with systemic corticosteroids as an empiric therapy for his condition before the correct diagnosis was made. Steroids produced some relief of symptoms, but relapse followed stoppage of the drug with flaring of the cutaneous lesions. ESS could not be performed as the patient was inoperable due to disseminated disease. The patient demonstrated an altered mental state and delirium and died 10 days after admission despite daily treatment with amphotericin B in a dose of 0.5 mg/ kg probably due to local CNS invasion. Granulomatous infiltrate in the chronic lesion with giant cells. Higher magnifications showing broad non-septate hyphae and spores. Higher magnification showing thick eosinophilic wall of the spores. The 5th patient before treatment. Despite the ubiquitous environmental distribution of entomophthorales, disease caused by these fungi is relatively uncommon. A small number of cases of rhinofacial entomophthoromycosis have been reported worldwide and literature is limited to case reports [8, 9 , 12, 15, 16] , small case series , and reviews [2, 3, 6] . The low prevalence of the disease has been attributed to the low virulence of the organisms and / or difficulty in disease diagnosis [2, 3]. Physical examination, especially in areas where infection is endemic, is an important feature of the diagnosis of rhinofacial entomophthoromycosis. Presence of subcutaneous lesions of the nose and perinasal tissues associated with chronic rhinosinusitis are suggestive clinical manifestations that should alert physicians for the possibility of the disease [1, 2]. Definitive diagnosis however, requires the demonstration of fungal elements in tissue sections and the diagnostic culture findings[1, 7]. Diagnosis of the disease is however, difficult and may initially be missed. Fungal elements in tissues may be rare and when present are often fragmented . 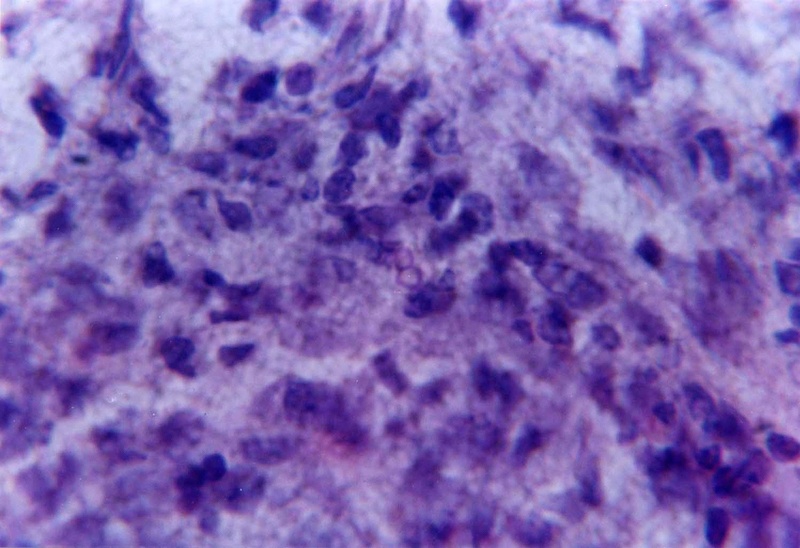 Additionally, focal hyphae may appear in only part of the specimen. Moreover, fungal elements stain poorly with H&E and are not well demonstrated with fungus-specific tissue stains as PAS . Culture remains the "gold standard" for disease diagnosis and species identification . Unfortunately, recovery of fungi in culture from clinical specimens is also problematic. Countless reports of negative culture results are scattered throughout the literature [2, 3, 4]. The reason for this appears to be the aggressive processing of the specimen that occurs before plating. Fungal hyphae are often damaged and become non viable during the biopsy procedure or by the chopping up or tissue grinding process in the laboratory . Because of these difficulties in culture techniques or presence of too little fungus to be cultured and because successful management of infections relies on early disease diagnosis; it has been agreed that microscopic identification of characteristic fungi invading affected tissues should be considered significant even if the laboratory is unable to recover the offending fungus in culture [1, 2]. In the present study, diagnosis of cases was based on suggestive clinical manifestations and morphologic tissue findings of the characteristic zygomycosis hyphae. Although aspergillus species was identified in 2 cultures, they were regarded as contaminants because fungal growth in culture should be interpreted as clinically significant only when the same organism is obtained from tissue sections . In both cases where aspergillus species was grown in culture, tissue sections showed the wide, non septate hyphae with wide-angle branching characteristic of zygomycetes which could be easily differentiated from those of aspergillus species that produce narrow, septate hyphae with relatively consistent diameter and that branch at acute angles of about 45° . All affected patients were males (5 adults and one child) who came from agricultural areas living and working outdoors in hot humid climates. Tropical disease concentration and male predominance have been consistently reported in the literature[1, 2, 3]. Infection is also demonstrated to occur mostly in adults with rare affection of children and adolescents . This disease distribution despite the wide ecological presence of the fungus may be related to an enhanced exposure to air-borne spores and may be also to the high ambient mold spore concentrations. Germination of spores is found to occur optimally in warm highly humid climates . Studied patients were all healthy individuals and infection was restricted to the nose and paranasal sinuses. Most cases of rhinofacial entomophthoromycosis reported thus far are non-invasive and occur primarily in normal immunocompetent hosts [5, 6]. Dissemination is uncommonly described with this disease. However, few cases are currently reported associated with immunosuppression [2, 14]. In two of the presented cases spread of the infection, with the development of fulminant rhinocerebral disease in one case, was related to the systemic use of corticosteroids. It has been postulated that systemic steroids enhance the susceptibility to developing invasive disease by suppressing the inflammatory cell response allowing proliferation of hyphal elements and probably also due to induction of a diabetic state which is a major risk factor for developing invasive disease . Based on these findings and on the small number of cases worldwide and reports of spontaneous healing of some cases  , it has been suggested that the organisms are of low virulence and that some, yet unknown, abnormality must account for promoting infection and disease progression in previously healthy individuals [2, 3]. Initiation of the inflammatory cascade is most likely a multifactorial event requiring inhalation of fungal spores with some form of minor traumatic implantation associated with aberration of local mucosal defense mechanisms. Intranasal injury or trauma such as seen with nose picking has been suggested to contribute to the disease[10, 11]. Moreover, some strains of entomophthorales have been demonstrated to produce extracellular enzymes postulated to play a role in the infection process. The release of these enzymes in vivo is suggested to be related to local tissue factors such as the level of fat deposits under the skin . Fungal strains isolated from infected humans have also been described to grow more readily at 37°C than do those obtained from environmental sources. This thermo tolerance may be of particular importance in developing human disease . In the present study, despite the simultaneous use of systemic antifungals and surgical debridement of the affected sinuses, studied patients have not shown good therapeutic response. This may reflect several factors as diagnostic difficulties leading to delay in treatment, chronic nature of the disease and drug noncompliance. The use of SSKI and co-trimazole has been described in treatment of entomophthorales infection with both successes and failures [1, 2]. Studies have shown that high doses of both drugs are required for organism inhibition in vitro. Resistance of entomophthorales to amphotericin B and a relative resistance to imidazoles have been described in several reports of in vitro antifungal susceptibility studies [3, 18]. In- vivo, imidazoles have shown variable effectiveness against the entomophthorales with both favorable responses as well as failures , [3, 5]. A recent review of the use of azole drugs in treating fungal infections concludes that there is no indication for the use of this class of drugs in treating zygomycetes . As the organisms' exhibit relative microbiologic and clinical resistance to antifungals, higher doses than usual are recommended for effective treatment. Daily high-dose therapy and months of continuous treatment must therefore be used. Taking these factors into consideration, patients usually do not comply due to adverse effects and drug cost. In the present study we have found combination therapy with itraconazole and SSKI and itraconazole and co-trimazole to be more effective than single drug therapy. Other reports of effective combination treatment using amphotericin B / terbinafine, co-trimazole / SSKI, ketoconazole / SSKI have also been published [2, 6, 20]. Clinical data are however insufficient to suggest synergistic antifungal activity between these drugs and further studies are warranted to determine the true efficacy of these combinations. Treatment options for rhinofacial entomophthoromycosis have so far been disappointing; therefore detection of infection in the early stages of this chronic disease may be the best way to reduce morbidity. Keeping a high level of suspicion for the predominant disease manifestations can aid an early diagnosis and implantation of appropriate therapy. In vitro studies have recently shown that the new triazoles variconazole and posaconazole have potent extended activity spectra in other filamentous mycoses [13, 21]. In the future, these new antifungal drugs under development may play an important role in treatment of of entomophthoromycosis. 1. Gonzalez C, Rinaldi M and Sugar A (2002): Zygomycosis. Infect Dis Clin North Am; 16: 117–125. 2. Ribes IA, Vanover-Sams CL and Baker DI (2000): Zygomycetes in Human Disease. Clin Microbiol Rev; 13: 236–301. 3. Elgart ML (1996): Zygomycosis. Dermatol Clin; 14: 141–146. 4. Eucker I, Sezer O, Barbara Graf et al., (2001): Mucormycoses. Mycoses; 44: 7-8, 253. 5. Prabhu RM and Patel R (2004): Mucormycosis and entomophthoromycosis: a review of the clinical manifestations, diagnosis and treatment. Clin Microbiol Infect; 10: 31–47 (Abstract). 6. Gugnani HC (1992): Entomophthoromycosis due to conidobolus. Eur J Epidemiol; 8: 391–396. 7. Gilbert DL, Khoury GH and Pore RS (1970): Histopathological identification of entomophthora phycomycosis. Deep mycotic infection in an infant. Arch Pathol; 90: 583 –587. 8. Davis DR, Ellis P, Goldwater S et al., (1994): First human culture – proven Australian case of entomophthoromycosis caused by Basidiobolus ranarum. J Med Vet mycol; 32: 225–230 (Medline). 9. Onuigho WI, Gugnani HC, Okafor BC et al.,(1975): Nasal entomophthoromycosis in Igbo from Nigeria. J Laryngol Otolaryngol; 89: 657–66. 10. Nathan MD, Ir Keller AP, Lerner CI et al., (1982): Entomophthorales infection of the maxillofacial region. Laryngoscope; 92: 767–769 (Medline). 11. Ng KH, Chin CS, Jalleh RD et al., (1991): Nasofacial zygomycosis. Oral Surg Oral Med Oral Pathol; 72: 685–688 (Medline). 12. Taylor GD, Sekhon AS, Tyrrell DL et al., (1987): Rhinofacial zygomycosis caused by Conidobolus coronatus: a case report including in vitro sensitivity to antimycotic agents. Am J Trop Med Hyg; 36: 398 – 401 (Medline). 13. Dannaoui E, Meletiadis I, Mouton IW et al.,(2003): In vitro susceptibilities of zygomycetes to conventional and new antifungals. J Antimicrob Chemother; 51: 45 –52. 14. Walsh TI, Renshaw G, Andrews I et al., (1994): Invasive zygomycosis due to conidobolus incongruous. Clin Infect Dis; 19: 423–430. 15. 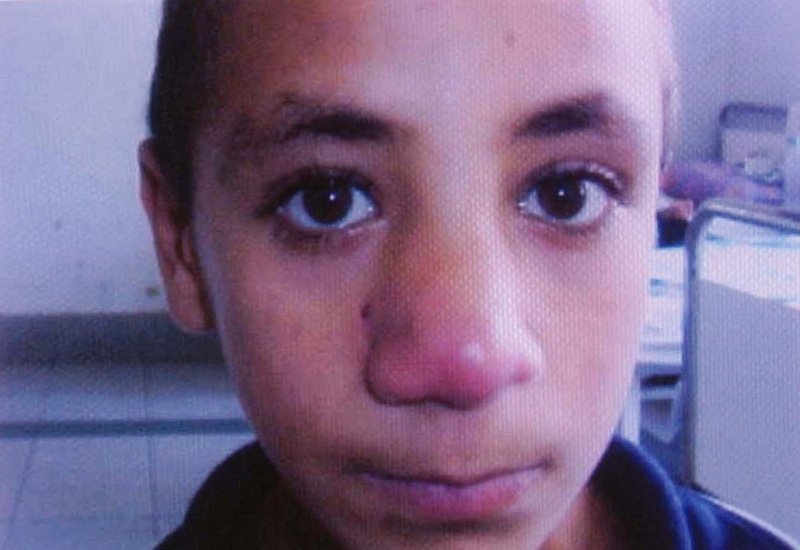 Costa AR, Poto IR, Pegas VM et al., (1991): Rhinofacial zygomycosis caused by conidobolus (sic) coronatus. A case report. Mycopathologia; 115: 1 – 8 (Medline). 16. Mukhopadhyay D, Ghosh LM, Thammayya A et al., (1995): Entomophthoromycosis caused by Conidobolus coronatus: Clinicomycological study of a case. Auris Nasus Larynx; 22: 139 – 142 (Medline). 17. Okafor JI, Gugnani HC , TeStrake D et al., (1990) : Lipase activity of Basidiobolus and Conidiobolus species . Mycoses; 33: 81 – 85(Medline). 18. Otcenasek M and Buchta V (1994): In vitro susceptibility to 9 antifungal agents of 14 strains of zygomycetes isolated from clinical specimens. Mycopathologia; 128: 135 – 137 (Medline). 19. Terrell CL (1999): Antifungal agents ? .The Azoles. Mayo Clin Proc; 74: 78–100 (Medline). 20. Foss NT, Rocha VT, Lima MA et al., (1996): Entomophthoromycosis: therapeutic success by using amphtericin B and terbinafine. Otolaryngology; 193: 258–260. 21. Dannaoui E, Afeltra I, Meis IF et al., (2002): In vitro susceptibilities of zygomycetes to combinations of antimicrobial agents. Antimicrob Agents Chemother; 46: 2708–2711.